Hard shell front panel is super durable. Features a screen printed UNSC Falcon! 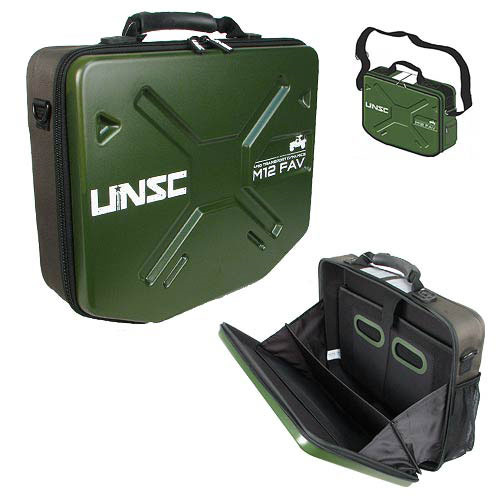 A hard shell accordion style messenger bag inspired by the equipment carried onboard the UNSC Warthog, the Halo 4 UNSC Warthog Messenger Bag's inner sleeve fits laptops 15-inches or smaller The bag itself measures 16-inches long x 13 1/4-inches tall, and boasts a mesh pocket for accessories. With a hard shell front panel for durability, a detachable swivel-clip key chain for style, and a screen printed UNSC Falcon and wordmarks so you know it's top-shelf, the Halo 4 UNSC Warthog Messenger Bag is perfect for the on-the-go fan! Ages 14 and up.